A client needed to heat an aluminum tube for a shrink fitting application. It is a component for an optical system. The client had been using an oven. They took advantage of complimentary applications testing and turned to Ambrell's applications team and their extensive experience to develop a solution. The aluminum tube was 19” (483 mm) long with an outside diameter of 0.875” (22 mm) and a wall thickness of 0.065” (1.7 mm). Laboratory engineers developed a four-turn split helical coil that enabled easy part loading. 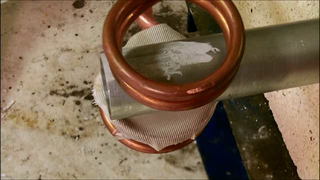 The customer required the part to be heated to 437 ºF (225 ºC) within 30 seconds, which an EASYHEAT 2 kW induction heating system easily delivered. An EASYHEAT 4.2 kW system could reduce the heating time to less than 18 seconds. To learn about more induction heating applications including other shrink fitting applications, visit the Induction Applications section of the Ambrell website.